The Bainbridge Island City Council has adopted regulations to protect "landmark trees." BAINBRIDGE ISLAND – The Bainbridge Island City Council has adopted regulations to protect "landmark trees." The emergency ordinance, which penalizes unapproved removal with a $25,000 fine per tree, is effective immediately. “I believe that much of what makes it (Bainbridge Island) special is our trees and forests, so when residents implore the Council to protect the special nature of our island, they are in large part telling us to protect our trees," Mayor Kol Medina said in a press release. " 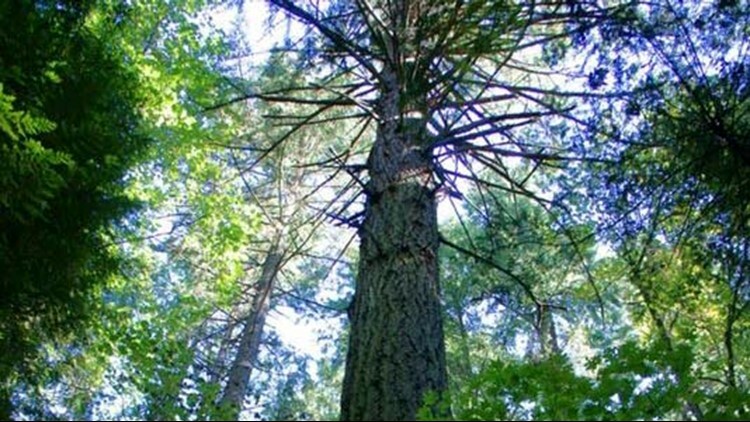 Under the new ordinance, the City Council must vote to approve the removal of any "landmark tree" on Bainbridge Island, defined per species by the diameter four-and-a-half feet above the ground on the uphill side. Most of the species listed in the ordinance are not protected if they have a diameter below 30 inches, except the Japanese laceleaf maple (12 inches) and Pacific madrone (24 inches). Previously, the municipal code did not include language prohibiting removal of large trees outside of the town center. City Manager Doug Schulze drafted the ordinance, the language of which was reviewed during a June 5 City Council study session. To remove a "landmark tree," the property owner must submit an application to the city planning director, who will write a recommendation for the City Council. Possible cases for removal include reasonable development or maintaining property access, as well as the tree being dead, diseased or hazardous. In some instances, the property owner will be required to plant replacement trees or donate to the city tree fund. If a "landmark tree" becomes an immediate hazard, it may be removed before council approval. The ordinance doesn't apply if a complete permit application was filed before regulations went into effect on Tuesday. The City Council voted 6-1 in approval of the ordinance, with Councilwoman Sarah Blossom casting the lone vote against it. As an emergency ordinance, it needed a majority plus one — or five votes — to pass and went into effect before a public hearing. Instead, a hearing will take place within 60 days. Blossom said she would not support the ordinance because it was a "knee-jerk, emotional reaction" and did not take into proper account other regulations for land development, like site assessment reviews and the Critical Areas Ordinance, which, in part, protects conservation and aquifer recharge areas. "This basically puts a large tree above all of those other considerations," she said during the council meeting Tuesday. Other council members acknowledged the imperfections of the ordinance but noted it is a temporary provision until the planning department can present permanent regulations. The interim ordinance will stay in effect for six months unless the City Council votes to revise, repeal or continue it, according to Planning Director Gary Christensen. Christensen said he expects permanent regulations to be similar to the interim ordinance, and revisions will be based on comments from city staff and the public. If a property owner is considering removing a possible "landmark tree," the city recommends consulting with a certified arborist to determine its status.